The latest research SOIL is conducting, in continued collaboration with the University of Hawai’i, is assessing how the thermophilic phase of the composting process facilitates the transformation of dangerous waste into safe and nutrient-rich compost. 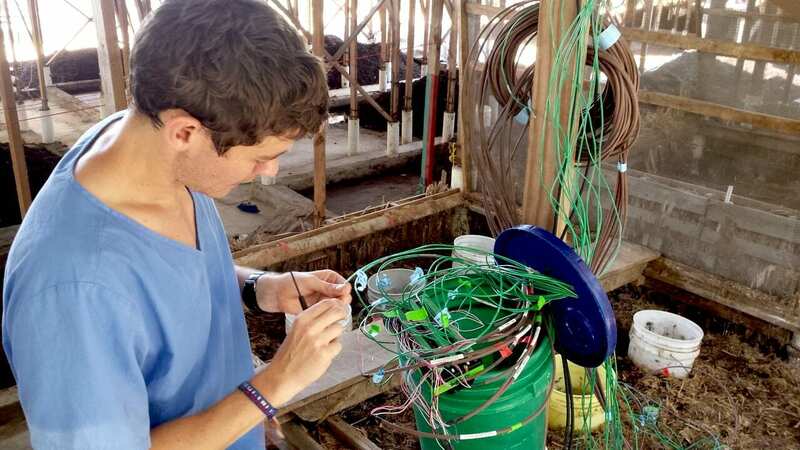 After months of careful preparation, UH Mãnoa ecologists Gavin McNicol and Dr. Rebecca Ryals visited SOIL’s composting site in Cap Haïtien to install sensors that will monitor key variables that affect the microbial life of a compost pile: temperature, oxygen availability, and moisture. The microbial transformation that occurs during the thermophilic composting phase is often delicate and sensitive to change, which is why we are bringing scientists and composting technicians together at SOIL to better understand it. Over the course of four busy days, Gavin and Becca worked alongside SOIL staff and Climate and Compost Fellows to install 36 sensors across SOIL’s fresh compost piles. The installation of over a half a kilometer of cables, which connect the sensors to a solar powered data logging station, was a challenging mix of both expected and unexpected hurdles for the research team. 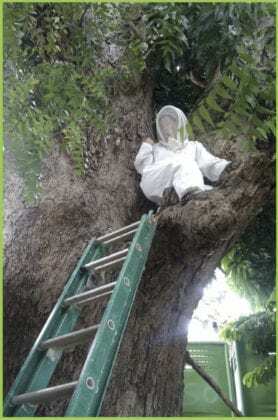 While stringing cables through the canopies of two giant trees, Rebecca even had to don a bee-keeping suit to safely dodge swarming wasps! Throughout the 90-day study, the new sensors will provide a rich set of data every 10 minutes to help us discover and document what conditions foster the best microbial and waste transformation. What exactly is the thermophilic stage of the composting process? Every time a microbe breaks apart the chemical bonds of an organic compound, such as those found in poop, a tiny amount of energy is lost as heat. When you build up a pile of organic material, like the waste inside SOIL’s compost bins, heat accumulates, getting trapped in the pile and causing the temperature to rise. Because microbes work faster at higher temperatures, there’s a positive feedback loop between the rate of decomposition and the production of heat – which ultimately creates the high temperatures necessary for thermophilic composting. These high temperatures produced during the thermophilic phase of the composting process facilitate super-charged decomposition where dangerous pathogens are overwhelmed by exploding populations of non-pathogenic “decomposer” microbes. It’s a microbial revolution! This is the same basic decomposition process that happens in our stomachs when our bodies break down our food, or in the soil as it breaks down leaves, twigs, and other organic matter. Every time SOIL fills up a compost bin with waste from EkoLakay household toilets, we are creating an environment that becomes a complex ecosystem which supports trillions of microorganisms. It is these microbes that do the dirty work of transforming human waste into stable and safe compost – Konpòs Lakay – that goes on to restore and replenish the earth. Check back to see what we’ve learned once the research team has collected and analyzed the data! 4 Replies to "Capturing the Conditions of a Microbial Revolution"
We invite these same sorts of researchers look at our Urine-diverting Dry Toilets in the Omaere Ethnobotanical Park in Ecuador (omaere.wordpress.com), which is on a much smaller scale, but we recycle our finished compost as cover material to innoculate the new feces with the microbes that broke everything down in the previous cycle. We have been doing this since 2011 and we have better control of smell and flies, compared to when we used a mix of sawdust and wood ash. Hi Chris! Thanks for sharing those links with our readers. We’ll share the results of the study when they’re available – check back in a few weeks! In some sewage treatment facilities, they have big heat exchangers, to be rid of the heat. One day it might get reused. I think the treatment of house hold waste is a great curriculum for children. It has so many types of knowledge. At the very least, free tomatoes and potatoes, could result. But as Cain worked the Soil in the Bible, the discernment leads to the compashinate Heart of Flesh. 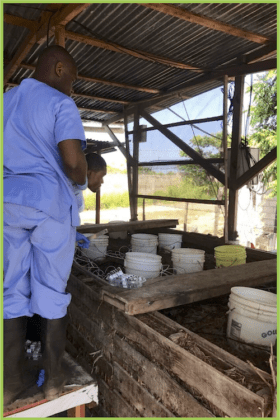 This link shows how they capture the gas from composting a mix of human and cow manure and use it for cooking in Rwanda’s prisons.